A SpaceX commercial cargo freighter jam packed with more than three and a half tons of research experiments, essential crew supplies and a new experimental inflatable habitat reached the International Space Station (ISS) and the gleeful multinational crew of six astronauts and cosmonauts on Sunday, April 10. The U.S. SpaceX Dragon cargo craft arrived at the ISS following a carefully choreographed orbital chase inaugurated by a spectacular launch atop an upgraded SpaceX Falcon 9 rocket from Cape Canaveral Air Force Station, Florida, on Friday, April 8. As the massive Earth orbiting outpost was soaring some 250 miles (400 kilometers) over the Pacific Ocean west of Hawaii, British astronaut Tim Peake of ESA (European Space Agency), with the able assistance of NASA’s Jeff Williams, successfully captured the SpaceX Dragon CRS-8 resupply ship with the station’s Canadian-built robotic arm. Peake painstakingly maneuvered and deftly grappled Dragon with the snares at the terminus of the 57 foot long (19 meter long) Canadarm2 at 7:23 a.m. EDT for installation on the million pound orbital lab complex. “Looks like we’ve caught a Dragon,” Peake radioed back to Mission Control. The orbital operational was webcast live on NASA TV. “Awesome capture by crewmate Tim Peake,” said fellow NASA crewmate Tim Kopra who snapped a series of breathtaking images of the approach and capture. Ground controllers at Mission Control in Houston then issued commands to carefully guide the robotic arm holding the Dragon freighter to the Earth-facing port on the bottom side of the Harmony module for its month long stay at the space station. The ship was finally bolted into place at 9:57 a.m. EDT as the station flew 250 miles (400 km) over southern Algeria. In a historic first, the arrival of the SpaceX Dragon cargo spacecraft marks the first time that two American cargo ships are simultaneously docked to the ISS. The Orbital ATK Cygnus CRS-6 cargo freighter only just arrived on March 26 and is now installed at a neighboring docking port on the Unity module. Cygnus was launched to the ISS atop a ULA Atlas V barely two weeks earlier on March 22 – as I reported on and witnessed from the Kennedy Space Center press site. “With the arrival of Dragon, the space station ties the record for most vehicles on station at one time – six,” say NASA officials. The Dragon spacecraft is delivering almost 7,000 pounds of cargo, including the Bigelow Expandable Activity Module (BEAM), to the orbital laboratory which was carried to orbit inside the Dragon’s unpressurized truck section. BEAM is a prototype inflatable habitat that the crew will soon pluck from the Dragon’s truck with the robotic arm for installation on a side port of the Harmony module. Friday’s launch marks the first for a Dragon since the catastrophic failure of the SpaceX Falcon 9 last June. Dragon will remain at the station until it returns for Earth on May 11 for a parachute assisted splash down in the Pacific Ocean off the west coast of Baja California. It will be packed with almost 3,500 pounds off cargo and numerous science samples, including those biological samples collected by 1 year ISS crew member Scott Kelly, for return to investigators, hardware and spacewalking tools, some additional broken hardware for repair and some items of trash for disposal. The SpaceX Dragon is set for its ‘Return to Flight’ mission on Friday, April 8, packed with nearly 7000 pounds (3100 kg) of critical cargo and research experiments bound for the six-man crew working aboard the International Space Station. Blastoff of the commercial SpaceX Falcon 9 carrying the Dragon CRS-8 resupply ship is slated for 4:43 p.m. EDT from Space Launch Complex 40 at Cape Canaveral Air Force Station in Florida. The weather outlook looks great with a forecast of 90 percent “GO” and extremely favorable conditions at launch time of the upgraded, full thrust version of the SpaceX Falcon 9. The only concern is for winds. The SpaceX/Dragon CRS-8 launch coverage will be broadcast on NASA TV beginning at 3:30 p.m. EDT with additional commentary on the NASA launch blog. SpaceX also features a live webcast approximately 20 minutes before launch beginning at 4:23 p.m. EDT. The launch window is instantaneous, meaning that any delays due to weather or technical issues will results in a minimum 1 day postponement. A backup launch opportunity exists on Saturday, April 9, at 4:20 p.m. with NASA TV coverage starting at 3:15 p.m.
SpaceX most recently launched the upgraded Falcon 9 from the Cape on March 4, 2016 as I reported from onsite here. Friday’s launch marks the first for a Dragon since the catastrophic failure of a SpaceX Falcon 9 rocket in flight last year on June 28, 2015 on the CRS-7 resupply mission. Also packed aboard in the Dragon’s unpressurized trunk section is experimental Bigelow Expandable Activity Module (BEAM) – an experimental expandable capsule that the crew will attach to the space station. The 3115 pound (1413 kg) BEAM will test the use of an expandable space habitat in microgravity. BEAM will expand to roughly 13-feet-long and 10.5 feet in diameter after it is installed. As a secondary objective, SpaceX will attempt to recover the Falcon 9 first stage by propulsively landing it on an ocean-going droneship barge stationed offshore in the Atlantic Ocean. 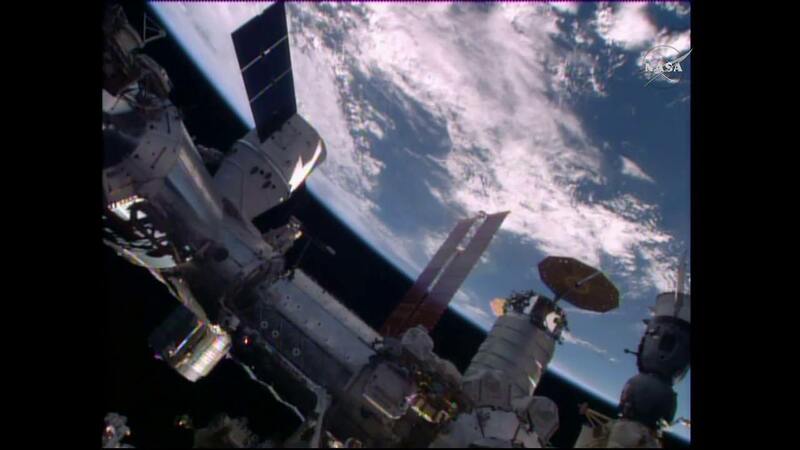 After a 2 day orbital chase Dragon is set to arrive at the orbiting outpost on Sunday, April 10. NASA astronaut Jeff Williams and ESA (European Space Agency) astronaut Tim Peake will then reach out with the station’s Canadian-built robotic arm to grapple and capture the Dragon spacecraft. Ground commands will be sent from Houston to the station’s arm to install Dragon on the Earth-facing bottom side of the Harmony module for its stay at the space station. Live coverage of the rendezvous and capture will begin at 5:30 a.m. on NASA TV, with installation set to begin at 9:30 a.m. In a historic first, the launch of a SpaceX Dragon cargo spacecraft sets the stage for the first time that two American cargo ships will be simultaneously attached to the ISS. The Orbital ATK Cygnus cargo freighter launched just launched on March 22 and arrived on March 26 at a neighboring docking port on the Unity module. Among the new experiments arriving to the station will be Veggie-3 to grow Chinese lettuce in microgravity as a followup to Zinnias recently grown, an investigation to study muscle atrophy and bone loss in space, using microgravity to seek insight into the interactions of particle flows at the nanoscale level and use protein crystal growth in microgravity to help in the design of new drugs to fight disease, as well as reflight of 25 student experiments from Student Spaceflight Experiments Program (SSEP) Odyssey II payload that were lost during the CRS-7 launch failure. Dragon will remain at the station until it returns to Earth on May 11 for a parachute assisted splash down in the Pacific Ocean off the coast of Baja California. It will be packed with numerous science samples, including those collected by 1 year crew member Scott Kelly, for return to investigators, some broken hardware for repair and some items of trash for disposal. SpaceX CRS-8 is the eighth of up to 20 missions to the ISS that SpaceX will fly for NASA under the Commercial Resupply Services (CRS) contract. Zinnia experimental plants growing aboard the International Space Station (ISS) have staged a dramatic New Year’s comeback from a potential near death experience over the Christmas holidays, when traces of mold were discovered. The name is Peake. Timothy Peake. And he’s set to follow in the (fictional) footsteps of fellow British citizen James Bond with a stay on a space station. In 2015, Peake will be the first British citizen to live for six months on the International Space Station. He’ll be a part of the Expedition 46/47 crew. NASA hasn’t publicly named all of his seatmates yet, but expect a lot of excitement across the former Empire when Peake has his turn. “This is another important mission for Europe and in particular a wonderful opportunity for European science, industry and education to benefit from microgravity research,” Peake said in a statement. There have been a bevy of British astronauts before Peake, both as joint nationals within NASA and even for private spaceflights (remember Mark Shuttleworth‘s and Richard Garriott’s ‘vacations’ on station?) Also, it’s quite possible that even more British citizens will get into space before Peake does in 2015. British songstress Sarah Brightman previously announced she will make a much shorter visit to the space station in 2015. That hasn’t been fully confirmed yet — there aren’t many seats available on Soyuz spacecraft after the end of the shuttle program — but it’s possible she could make it up there. Getting back to Peake, some important secondary news came out for the latest corps of European astronauts: all of them are expected to fly before the end of 2017, as ESA previously promised. Two other Shenanigans are assigned to spaceflights: Alexander Gerst and Samantha Cristoforetti, who will make the journey around 2014. It’ll be a little while before the last two astronauts, Andreas Mogensen and Thomas Pesquet, get confirmation of flight assignments, but it should be by announced by mid-2015, stated ESA’s director-general, Jean-Jacques Dordain. “The value of Europe’s astronauts and the training given at the European astronaut center is reflected in the large number of mission assignments awarded to ESA astronauts,” stated Thomas Reiter, ESA’s director of human spaceflight and operations. You can follow Peake’s training at his Twitter account, and he has promised to keep up his social media efforts in space. “I certainly will be tweeting from space. A large part of what I want to achieve on this mission is to try to inspire a generation and encourage them to continue to support space flight and microgravity research,” Peake said in a press conference, as reported by The Guardian.